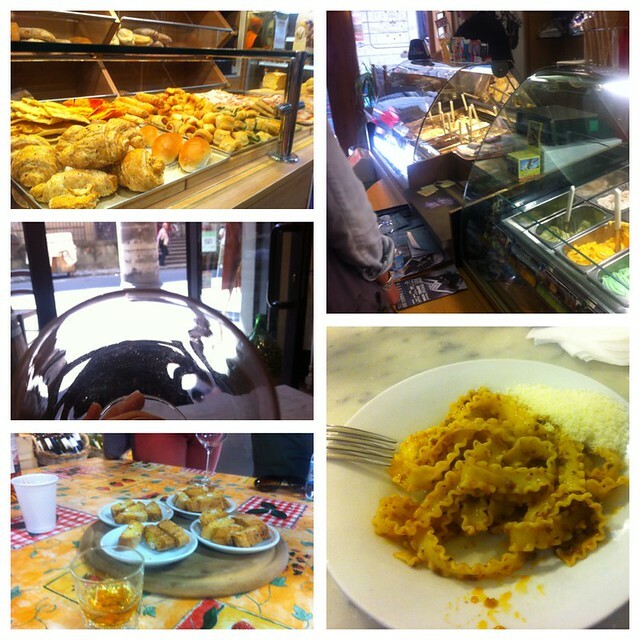 Today was the day for my Florence Food Tour, something I’ve been waiting excitedly for. Taking Google Map’s direction advice, I took the C3 bus, hoping to drop near the office. As the bus turned, I balanced myself on my feet, afraid that I might crush the brittle arm of the old lady. I decided to get off at the next stop because the old lady seemed to be quite pissed with my bum being on her arm. The next bus that came was rather empty but I still missed my stop. I hopped off at the next stop and started walking to the office with Google Map’s help. The problem with Google Map was that it listed the office at the other end of the street. It took me a while before I actually reached the correct spot. Our guide was Angela, a Sicilian. The other tour members were a young Iranian couple from the US and an older couple from Holland. 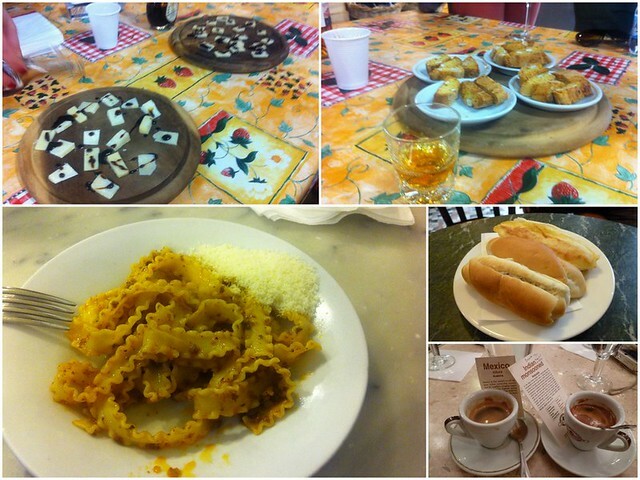 Our stop included coffee, wine, truffles, olive oil, balsamic vinegar, bread, pasta and gelato. Everyone on the tour was stuffed to the brim before our last gelato stop. Of course we still managed to wolf down our gelato since desserts are processed in our other stomach. Halfway through the tour, my digital camera suddenly grew a wound-like slash in its lens. Every photo came out with a blotch. I thought this was the end of my camera but luckily it went back to normal later in the day. I did a whirldwind tour of the Medici chapel and the Palazzo Medici Riccardi with my Firenze Card. The chapel’s fresco were really impressive but we couldn’t take photos so it wasn’t that exciting. Next stop was Michelangelo’s David. When I got to the Accademia Gallery, there were two lines for those with reserved tickets. (Firenze Card holders count as reserved ticket folks.) Instead of queuing at the second line, I visited the Archaeological Museum to pass time. The museum had a rather impressive collection of mummies. The mummies didn’t look very appetizing and made me worry about the day when they would arise from the dead. After about an hour of the museum, I headed back to see David. The line was much shorter and I got in quite soon. The marble statue of David is rather impressive. It is really tall (14 feet plus the pedestal) and carved very finely. 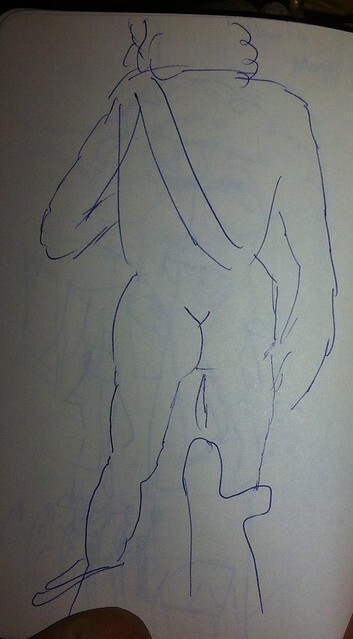 Since we could not take photos of David (many people still do), I drew a few sketches for you. Of course I wasn’t born a drawing genius, nor was I trained in drawing, so just be happy about what you see here and don’t complain too much please. In case you are wondering, the second photo is David’s bum, not a picture of the Elephant Man. I listened to Rick Steve’s audio tour for the Accademia and David. It’s good enough if you (like me), do not want to spend money on the official audio guides. After looking at the rest of David’s companions in the Accademia, I headed back to the square to my favorite cafe for a cappucino and tiramisu. It was about 6:00pm when I was done with my cake. I looked at my map and realized that I need to check off a lot more places today with my Firenze Card so I have more time tomorrow. 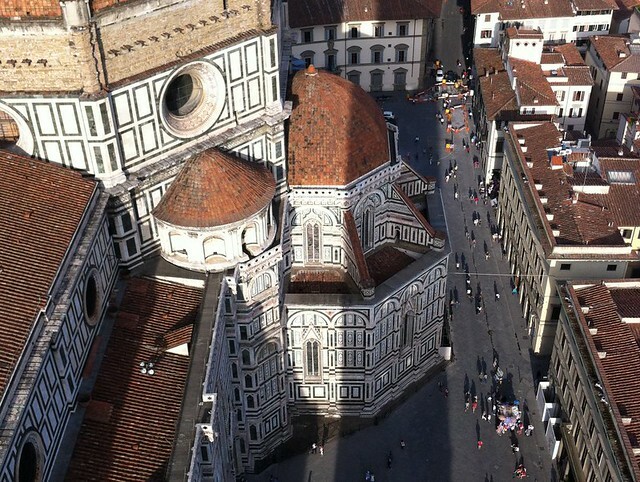 I had the crazy idea to climb the bell tower of the Santa Maria delle Fiore church. It was 414 steps, divided into five or so spiralling staircases. I was very out of breath by the time I reached the top. The view was very nice from the top but I didn’t think it was worth 414 steps. If the Firenze Card didn’t cover this site and I’ve paid cold hard cash, I think I would have found all the stair climbing a refreshing exercise. The sky was still light by the time I walked back at about 7:30pm. I dropped in the restaurant next to my hostel and ate a humungous plate of seafood pasta. That was all for the day. If you haven’t added me on Twitter, please add @yqtravelling. I usually spam that account since it’s less intrusive compared to spamming Facebook or the blog. Florence is one of my favourite cities! If you are still there you should check out Acqua al due for an amazing blueberry balsamic steak, or go to the Art Bar for amazing cocktails!